Raj used to be a disc jockey at Thailand's number 1 hits music station which he basically has to speak and entertain his imaginary audiences in front of a microphone alone in the studio. On a countdown night to the year 2007, he was filling in for another DJs and he hosted the show for 9 consecutive hours. That was a lot of talk. Now in 2017, Raj barely speaks if he finds nothing meaningful to say, instead, he writes. Back to his twenty-somethings, Raj spent a big portion of his life grooming himself with many creative and inspiring stories from Ogilvy & Mather. He went in as a boy and walked out as a man. Ogilvy was a school of everything to him. His time with Ogilvy wasn't just the most exciting years for his career, but it is, so far, the most exciting years of his life. From advertising industry to hotel, Raj is now a full-time hotelier. He considers himself as a story teller for the hotel. Although he is a communications specialist but when it comes to his personal feeling, he has a hard time telling people how he feels. He doesn’t want just to say “Yea, I'm alright" kind of sentence but the authentic feeling of one specific moment or special event in life. The fact that Raj observes things and people around him way much more than he speaks, he often turns his observation into an analytical process for his own pleasure. He finds himself fall deep in his own "thought-traps" that sometimes he doesn't want get back to the reality. Raj often went on his solo traveling to some inspiring places. Deep down he is that one person who wants to inspire people. He wants someone to look at him and say "Because of you, I didn't give up"… and in order to do that, Raj follows his own simple logic that before he could inspire people, he needs to be inspired first. With that, Raj decided to form a solid platform - roadtripwithraj.com - where he will take the advantage of this space to write his thoughts out loud; it could be a mid-night thoughts while he is on his road trip, people who he meets or even a random thought that pop up out of nowhere while he is in the elevator going up to the top floor of a tall building. Raj started to roof in mid 2016 and he sees this rooftopping activity to meditate himself and that he can stay focus and be in the moment with no one else but his own mind. Click here for his Rooftopping notes. Raj puts himself close to arts since he was young but his love for art was something he has lost during a rough patch in his life, it was in 2015, a year before he turns 30, for he has pretty much lost his passion for everything. Possibly it is a "fear of being thirty" - an instant death of youth and free-range irresponsibility while Raj was so not ready to be thirty yet. The stress formed itself bigger and bigger, to the point that he has no idea who he was. His mind was a dangerous, alien thing to him. In the end, what helped him grow his life's purpose and taught him to hold tight to that leap of faith, meaning, sadness, acceptance and all the good things was finding his way back to art. Writing. Photography. Art. To him, it is all one and the same. 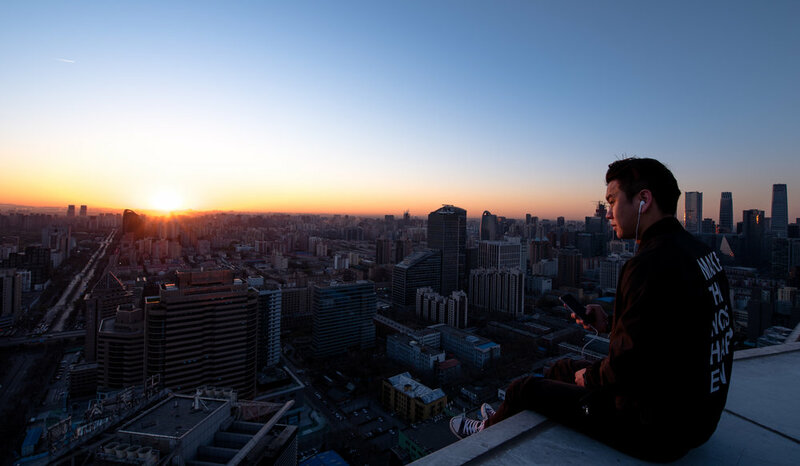 Surrounding himself with stunning view of the city at the peak point where only a few people can access. He feels so privilege that he is able to personally say "Hi" or "Bye" to the sun that is rising or setting. All of that simple pleasure resonated him - it allows him to build a kinder world inside himself. And when he was able to do that, it bled out into the outer world and made his life more meaningful to him, and hopefully someone around him too.